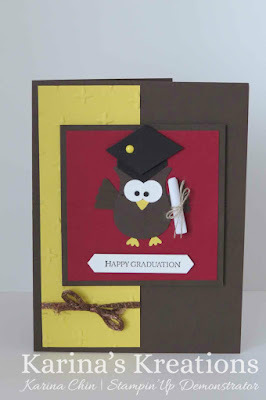 Karina's Kreations: Stampin'Up Owl Builder Punch! The Owl Builder punch is retiring on May 31. Do you own it? I was going to place it in my Buy One Get One Free Sale on June 2 but it I can't part with it! It makes such cute cards!! My daughter had grad on Thursday and I made her this cute card using the punch. To make this cute card, start with a 5-1/2" x 8-1/2" Early Espresso card base scored at 4-1/4". Add 2" x 5-1/4" Daffodil Delight card stock embossed with the Sparkles embossing folder. Attach 3" x 3" Cherry Cobbler card stock to 3-1/4" x 3-1/4" Early Espresso card stock and then to the cards. The owl was punched with the owl builder punch #118074 from Early Espresso, Whisper White and Daffodil Delight card stock. The wings were made with a scallop oval from the Layering Circle Framelits#141705. I drew the hat on scrap paper and cut it out to use as a template. The greeting is from Teeny Tiny Wishes #127802 punched with the Classic Label Punch #141491.